Xcaret is definitely a place you have to visit more than once to discover all it has to offer. However, if you are a water activity fanatic, there are 5 you definitely must do without a doubt. And of course, swimming with dolphins is one of them. La Laguna: with very calm waters, la Laguna is home to many endemic bird species of the Yucatan peninsula. Explore the passages and caves inside the clear waters. You will love it! La Playa: also very well known, la Playa of Xcaret has everything you need to relax under the sun, or the shade if you prefer. The white sand and the fresh seawater will make you forget all your worries. Pozas Naturales: these pools are similar to a jacuzzi, but completely natural. You can enjoy the waves and the water movement without being in open waters. Enjoy the sun and the sound of the ocean. Did you know that in the underground of the Yucatan Peninsula there’s a network of water channels? In the subterranean rivers of Xcaret, you can enjoy the cave labyrinths that extend along 600 meters. Do this before your experience of swimming with dolphins! Discover the Rio Azul, the Manati and the Maya, 3 rivers that flow into the mangroves of pink flamingos. Those rivers are one of the things you must see in Xcaret. Get on a boat bound for a nearby reef and live the experience of snorkeling among numerous fish and corals. This adventure will create memories that you will never forget. What would you think about walking 30 minutes at 5 or 7 meters deep? In Xcaret, you will only need your swimming suit to walk under the water and enjoy all the beauties that the Caribbean has for you. With the guides’ help and a special helmet, everything is possible! We all dream of swimming with dolphins in Xcaret at least once in our lives, but wait! This is possible. During 45 minutes, you can enjoy the company of these charismatic animals. Between kisses, fin squeezes and a Caribbean travel, your experience of swimming with dolphins will be unforgettable! Xcaret is the ideal place to make a lot of your dreams come true. 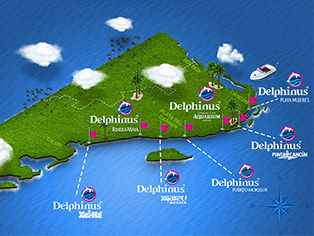 If one of them is to swim with dolphins in Mexico, you can do it with Delphinus. Come and see!